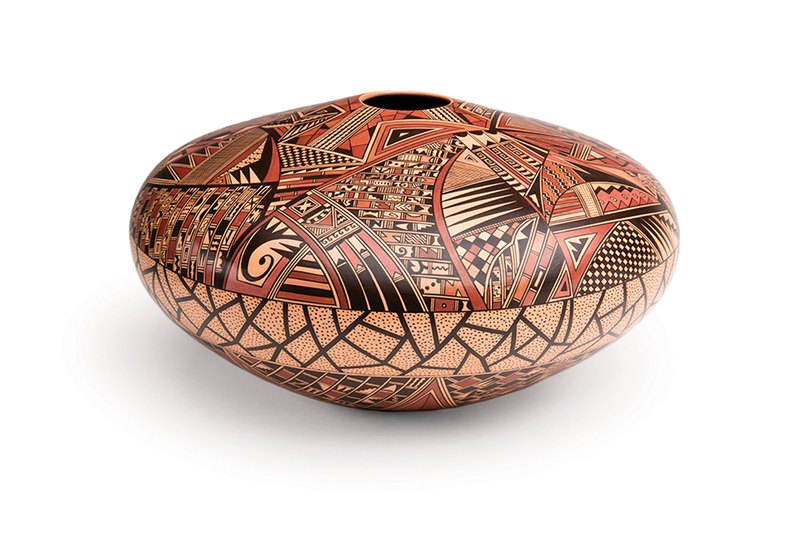 A blend of cultures and traditions old and new make Santa Fe an enchanting craft destination. Published on Monday, October 22, 2018. This article appears in the October/November 2018 issue of American Craft Magazine. On Museum Hill, visitors can find a range of art by Native Americans, Spanish colonizers, and artists from all over the world. Set in the sun-drenched Southwest landscape, Santa Fe is awash in dusty desert hues by day; by night, it glimmers with silver jewelry from shop windows. Stained-glass windows glow in its basilicas and chapels, while the 17th-century Palace of the Governors, one of the oldest public buildings in the US, stands as a testament to its colonial history. Witness the city’s low-slung adobe architecture, makers selling handmade wares on the sidewalks, and plethora of museums, galleries, and boutiques specializing in craft, and you won’t be surprised to learn that Santa Fe is part of the UNESCO Creative Cities global network, recognized for craft, folk art, and design. 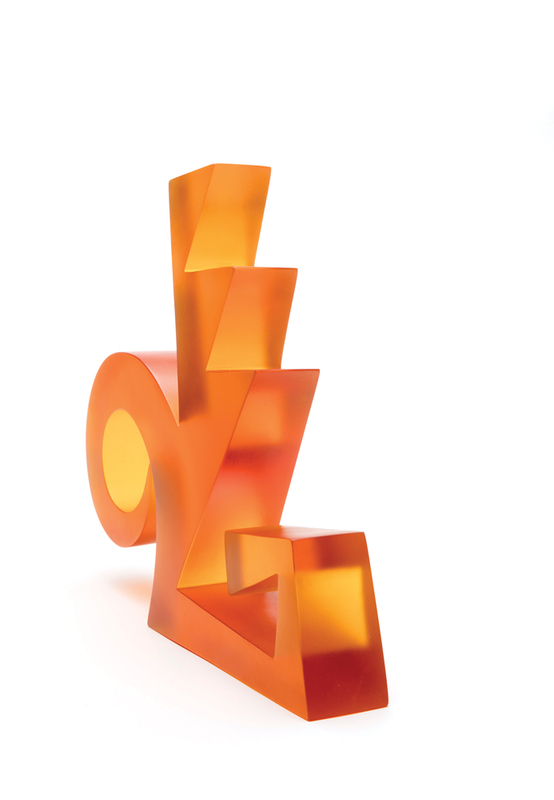 Patina Gallery is just one of Santa Fe’s art venues devoted to contemporary craft. 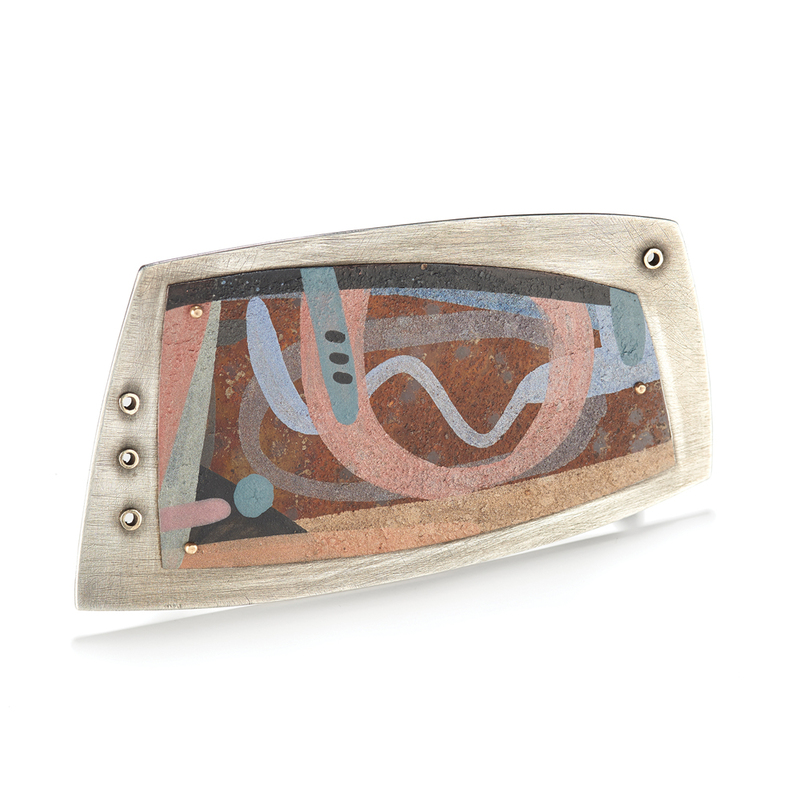 The Penasco River brooch (1998) by Patina owners Allison and Ivan Barnett celebrates a scenic river north of the city. 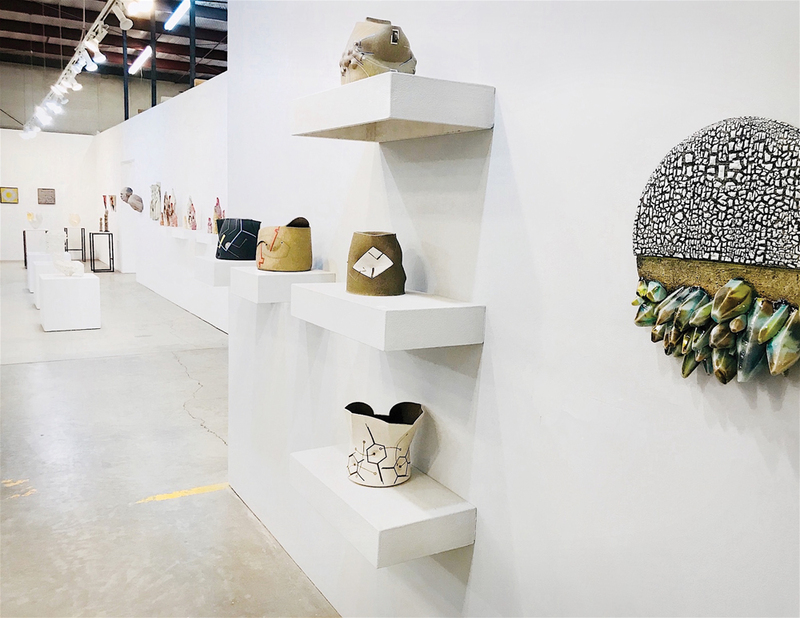 Santa Fe Clay offers studio space, workshops, and a gallery showing national and regional makers. 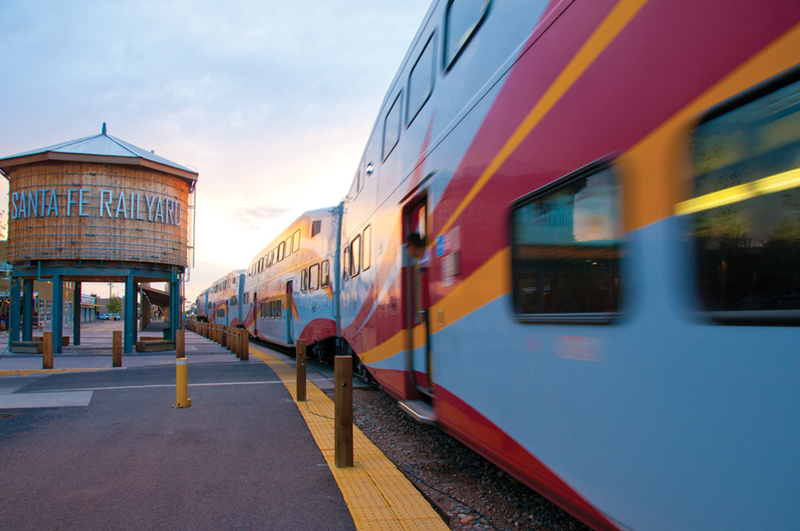 The Railyard Arts District features artisan markets and a growing list of galleries and craft centers. 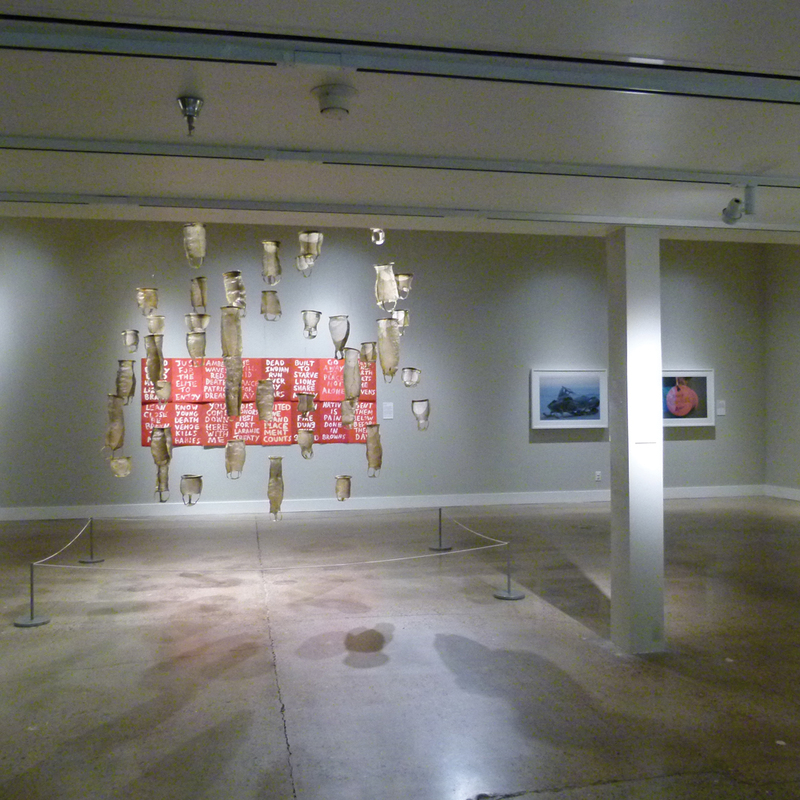 IAIA Museum of Contemporary Native Arts: The recent exhibition “Without Boundaries” highlighted work by artists addressing social issues such as decolonization and climate change. Native American makers line the portal of the Palace of the Governors, built more than 400 years ago. This prime spot is reserved for members of New Mexico tribes and pueblos. 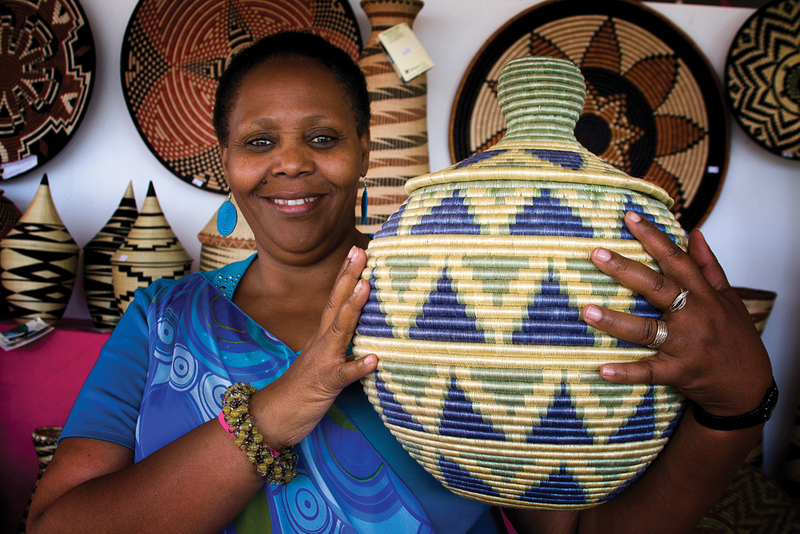 International Folk Art Market: This world-renowned fair offers wares from across the globe, such as baskets by Janet Nkubana of Rwanda. 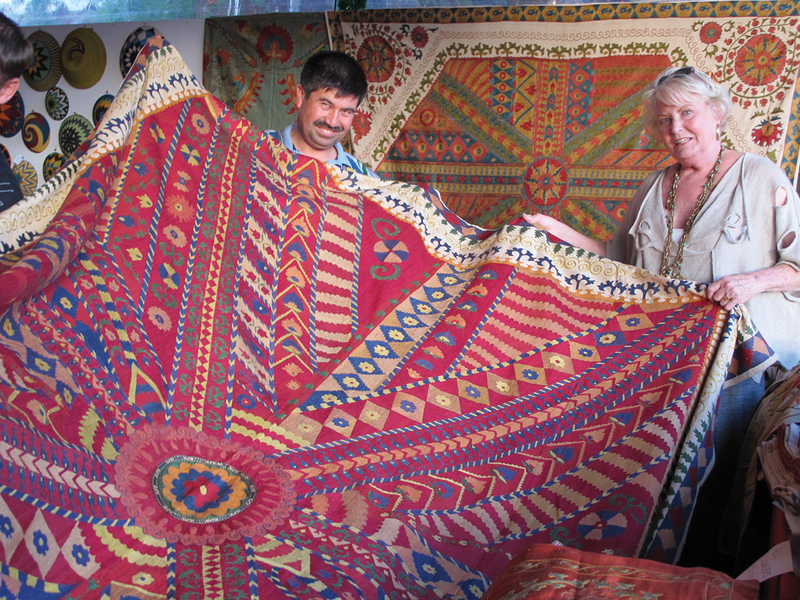 International Folk Art Market: This world-renowned fair offers wares from across the globe, such as Uzbek textiles. Museum of Indian Arts and Culture: The extensive collection showcases art and other work by the Southwest’s first residents, from prehistory through today. Works by contemporary artists – such as Les Namingha – are among recent acquisitions. Museum of Indian Arts and Culture: The extensive collection showcases art and other work by the Southwest’s first residents, from prehistory through today. Works by contemporary artists – such as Tammy Garcia – are among recent acquisitions. Keshi: the Zuni Connection: This shop specializes in carvings, jewelry, and pottery by Zuni Pueblo artisans, such as Jaycee Nahohai. Making the rounds in the Winter Market could take an entire afternoon, with handmade rugs from all over the world, racks of vintage clothing and boots, and baskets and beads galore. A businessman from Nepal stands just outside the door selling original and reproduction Navajo rugs at prices that could compete with trendy knockoffs sold online. A few booths down, Kewa Pueblo husband-and-wife duo Jeremy (Raincloud) and Eileen Rosetta show their modern jewelry in silver, brass, copper, and turquoise, work that often incorporates symbols and stories of the Pueblo people. In Santa Fe, the past folds into the present, attracting makers who add their own spin to centuries-old traditions. This ethos of exploration, building on the rich history of the area and its people, permeates both the city and its maker culture, as whole new traditions are born. This central part of the city has kept its charm over the centuries. In front of the Palace of the Governors, artisans sit shoulder to shoulder selling jewelry and other wares. 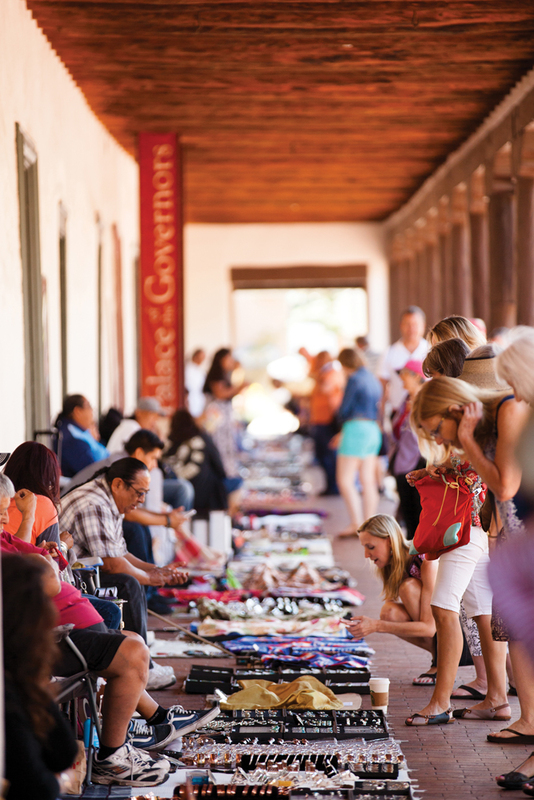 Browse their handmade gifts, then take a short walk to the circuit of museums that highlights Santa Fe’s maker history, including the IAIA Museum of Contemporary Native Arts and the New Mexico Museum of Art, the state’s oldest art museum and a prime example of Pueblo Revival architecture. Stop at Shiprock Santa Fe, a shop specializing in historic and contemporary Navajo work, including rugs and blankets, as well as designer furniture and fine art. Take a breather at Santa Fe Plaza, the heart of the city and a historic landmark, before walking to Patina Gallery, which sells studio jewelry by luminaries such as local beadworker Claire Kahn as well as fine craft in other mediums. 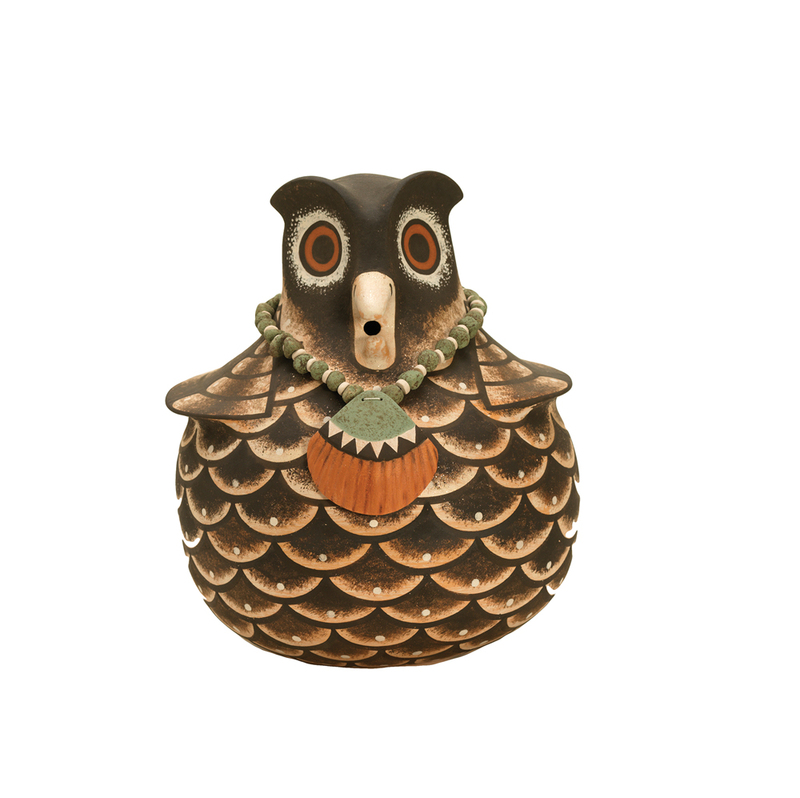 Round out your day at Keshi: the Zuni Connection, which showcases work by Zuni artists and specializes in wooden animal fetishes. Plan to spend a full morning at the Santa Fe Artists Market, held every Saturday from March through December in the burgeoning Railyard Arts District. (Be sure to stop at an ATM on the way, as many of the booths only accept cash.) Trendy shoppers will enjoy strolling through the smaller Railyard Artisan Market, held every Sunday from 10 a.m. to 4 p.m., where you’ll find contemporary takes on traditional jewelry. Cross the railyard to El Museo Cultural de Santa Fe Winter Market, where vendors from all over the world sell both contemporary and antique art from October through May. From there, take a short walk to Form & Concept, a gallery dedicated to contemporary art, craft, and design. The gallery shows a wide variety of pieces ranging from New Mexico artist Jaque Fragua’s poignant neon wall pieces to local jeweler Bunny Tobias’ sculptural necklaces and art objects. While you’re in the area, be sure to stop by Santa Fe Clay to browse in their shop and gallery as well as peek into the studios of local potters. Museum Hill sits high above the city and provides a great view of the Santa Fe Botanical Garden below. Institutions to explore include the Museum of International Folk Art, the Museum of Indian Arts and Culture, and the Museum of Spanish Colonial Art. 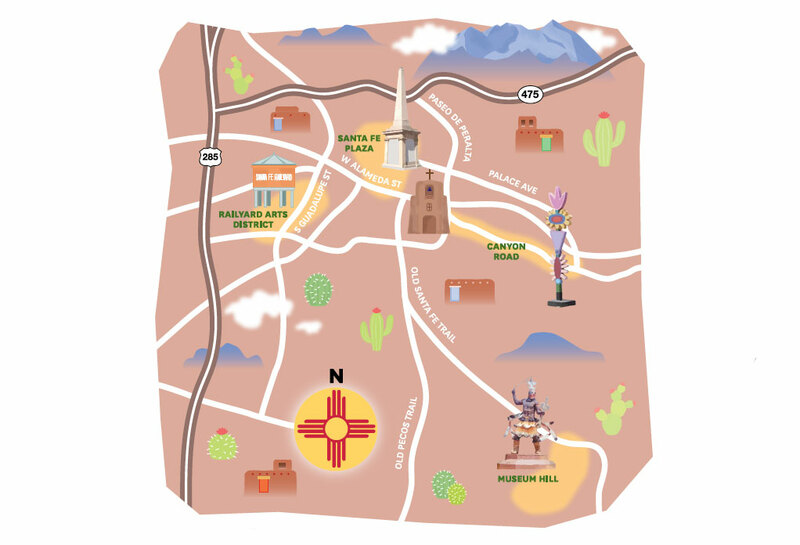 This half-mile arts district is a seven-minute drive from Santa Fe Plaza. The area is chock-full of boutiques, restaurants, and about 50 galleries, including Tansey Contemporary, which opens a show of Clare Belfrage’s handsome glass vessels on October 19.